In Military Salute, teams build soldier care packages to be given to soldiers stationed overseas. Military Salute is designed by Quixote Consulting founder Rob Fletcher. Rob is the co-author the award winning Remembrance: A Tribute to America’s Veterans book with his father Robert A Fletcher, a Korean War veteran. The Remembrance military tribute project inspired Rob to design this military team building activity to help some of the more than 250,000 soldiers stationed overseas as well as injured soldiers in Walter Reed Hospital. Military Salute helps corporate teams pause to give tribute and to remember the sacrifices our brave men and women make every day. Quixote consultants have helped hundreds of companies just like yours make thousands of care packages for military families, veterans and soldiers that need them most. Your team’s marching orders? Navigate fun, innovative military-inspired puzzles and challenges to earn enough “soldiers” (remember those toy soldiers when you were a kid?) 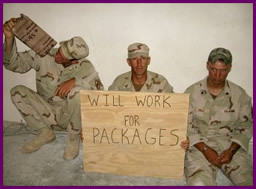 to exchange at our PX for that last crucial gift to complete your care package to be sent to military serving overseas. Military care packages are jam-packed with essential gifts to brighten our military members’ days, wherever they are stationed. Handmade multi-media thank yous from your team included in the packages bridge that long distance from home to overseas. Let them know they are not forgotten, even though they are far away! Teams earn points by completing military-inspired challenges (that can be customized just for you!). Successful military operations rely on the same skills that every successful corporate team requires: communication, managing change on the fly, and superlative team work. Quixote Consulting took some of the classic military team building challenges and skills needed and created our own versions that are accessible to all and can be done anywhere, from board room to ball room. A wide variety of challenges from active to cerebral ensure that all participants are engaged and having fun! Military History Trivia Challenge – Complete a dizzying array of interesting military history trivia challenges from all of America’s wars taken from Quixote Consulting founder Rob Fletcher’s award-winning book that honors America’s military Remembrance: A Tribute to America’s Veterans. Minefield – Can you guide your teammates through safely? Worst-case scenario: What would you do? Flag Fold-off – Inspired by Rob Fletcher’s days as an Eagle Scout – how well can you fold our flag? With so many different ways to have fun and earn ‘soldiers’, there’s something for everyone on every team to do. The group can only be successful by working together, communicating effectively, identifying strengths of team members, and focusing on their mission – helping our military. Whenever timing permits, a soldier and/or USO representative comes to meet your team, thank them and personally receive the military care package gifts to be shipped overseas. There are more than two million military personnel today serving around the world. The one percent of our population making such deep sacrifices every day for us deserves 100% of our support. Help show our heroes you care! Research tells us that one of the main paths to happiness is to connect with the power of purpose. This power of purpose ignites when you link your daily work with the greater good, helping to make some part of the larger world around you better. Honoring and learning from a purpose-driven organization – the U.S. military. Helping the U.S. Military, Veterans and their Families: By focusing on the military as recipients and having a tangible, memorable and direct experience with them and their mission. Working and Succeeding Together: By interdependently working with everyone on your team every step of the way. You’ll be amazed at how energizing Military Salute military team building exercise can be for everyone involved. You will also realize what your team can accomplish back at work after an event that has everyone working together for such a rewarding cause. We all want to make a difference in this world. Here’s a rare opportunity to actually do so, with immediate, tangible results built into the process. This is an extraordinary way to infuse a conference with energy, create a feeling of immense good will and a sense of meaning larger than day-to-day work challenges, while reinforcing the value of teamwork. If you want an event that your people will never forget, this is the one. We take care of all the logistics – making you look good while making the whole event simple and painless. Every aspect of Quixote Consulting’s Military Salute military team building program is aimed specifically for your team and the recipients to get the most out of the event – before, during the day and after. Icebreaker with Purpose – Your event begins with a fun, fast-paced energizer that lets people learn something wonderful about other people on their team related to purpose and uncovering connections to military. Challenges with Purpose – Every challenge that teams complete to earn their care package material tests and reinforces the time-honored principles and lessons of teamwork our military provides. Customization – We can customize as much or as little of this event as you want – challenges, care packages, rules, even the game itself. If there’s a theme for your conference, convention or team project, let us know and we’ll make it happen. If you have active or retired service members in your group, or family members serving, let us know and we’ll incorporate their contribution into the event. Content with Purpose – If you have the time, we’ll combine a mini-training session on the Power of Purpose before Military Salute at no extra charge. This mini-session is perfect if you have three or four hours total. Resources After the Event –The leader of your team will receive a complimentary signed copy of Quixote Consulting founder Rob Fletcher’s book Remembrance: A Tribute to America’s Veterans and accompanying music CD to share with the team. Quixote Consulting will also sponsor a quantity discount if you would like to order a copy of the Remembrance book and CD for everyone who participates. And everyone receives both the Power of Purpose e-book by team strengths expert Rob Fletcher (an excerpt from his forthcoming book At Your Best) and wonderful pictures of the event to keep the energy and momentum going. Complimentary Coaching After the Event – The leader of the team will also receive one complimentary follow-up executive coaching session to assist in the learning transfer. Press Release (Optional) After the Event – Let the rest of the world know about your good deeds! We’ll send a press release to the news outlet(s) of your choice after the program with a photo of the event if you’d like. Conversation Starter (Optional) Before the Event – If you like, we provide you with a quick conversation starter for people to think about and share with other members of the team before the event. This builds anticipation, allows people to start ‘good gossip’ about your event and makes the event even more memorable. Professional Development (Optional) – Combine Military Salute with one of Quixote Consulting’s training programs such as the strengths-based program At Your Best or an assessment such as MBTI, Firo-B or StrengthsFinder for a full day of professional development that blends fun and content to be all you can be. Quixote Consulting consultants have led team building events around the world: on most of the continents (not Antarctica yet) and in different languages, including Spanish and Portuguese. This program includes a debrief by a trained facilitator. The debrief focuses on linking the activity with your important work back at the office. Military Salute debrief helps you to leverage the power of purpose back at work, discover team and individual strengths and link your performance with contributing successfully as a team. Portions of the debrief can be customized for your group goals. 15 to more than 5,000 participants. The larger the group, the more care packages you make, and the more veterans, service members and their families in your community benefit! We've worked with very large and very small teams around the world. 2-4 hours. The program can also be part of a full day incorporating Team Collaboration Quest collaborative team building or a work-style assessment such as MBTI or StrengthsFinder. This provides a perfect partnership of content-based training and a powerful story and image of your team collaborating successfully. 20 square feet of open space per participant is a good guideline. Military Salute can be indoors or outdoors - your office building, a ballroom or conference room, even a local park. Military Salute can be held anywhere in the world. We come to you, complete with everything you'll need to insure an exhilarating and memorable event. The leader of your team will receive a complimentary signed copy of Quixote Consulting founder Rob Fletcher's book Remembrance: A Tribute to America's Veterans and accompanying music CD to share with the team. Quixote Consulting will also sponsor a quantity discount if you would like to order a copy of the Remembrance book and CD for everyone who participates. We also send action photos and further resources to participants after the event. These resources guide participants in making a strong link between their positive experience and their important work back at the office. And when possible (sometimes current military restraints prevent recipients from writing back), your group will also receive a Thank You card and/or photo from the military recipients. "We will remember them." With compelling scenes from the Revolutionary War to the war in Afghanistan, artist and Korean War veteran Robert Fletcher and his son Rob provide a legacy for the nation's 26.2 million veterans who are alive today and all who preceded them. Nearly half of all Americans who served during wartime in our country's history are alive today. Tribute is paid to them by providing a view of their lives that has not been addressed before. Remembrance is the first book to depict veterans and military funeral scenes from all of America's armed conflicts in a series of precise and poignant watercolor paintings and pencil drawings.